Your Morning Commute Is Terminated! A T-600 (from Terminator Salvation) took over Toronto's Yonge and Bloor subway station, flashing its eyes and moving around, to the terror of morning commuters. A few more super-detailed pics below. 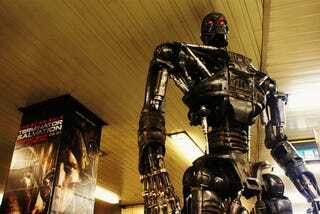 According to this article, the lifesize killer robot caused a fair bit of commotion on the subway platform. And it appeared a day late, because there were huge problems getting a massive metal monster through security at an American airport. Major thanks to Intrepidacious on Flickr, for posting such amazing pics. I love the moody silhouette of the Terminator against the institutional walls of the subway station. You can see more, and bigger, pics over at her Flickr page.